Well that was 8 days wasted. Here's your rocks, now what? We spent the day going through the nuances of the hyperjump drive. My engine has the ability of atmospheric flight on planets, space flight for between planets and now hyperjumps to travel between solar systems. My next task is to travel to Betelgeize, an 8 parsec jump. It all sounds good in theory, but there's been rumours floating around the mess hall about monsters in the empty space between jumps. The instructor waved away the rumours as hogwash though, and personally vouched for over 40 years of hyperjump travel without incident. With 10 grand burning a hole in my pocket, I took a trip through Trader Alley to see if there was anything useful for my ship. The first purchase was a larger capacity fuel cell that held 24 units of fuel. 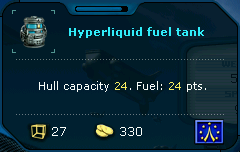 That's the jump capacity of my engine, so it only made sense that I needed the same amount of fuel for the jump. The merchant agreed (don't they all?). 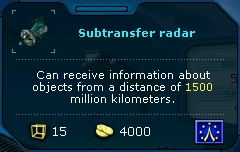 Next up was a lightweight Subtransfer Radar. The salesman mentioned the virtues of a sleeker design was that you got the same functionality with less hull space taken up (it's 1/2 the weight at 15 tonnes). That meant more room for trading and I'm all for that. It was expensive though at 4000cr, almost 1/2 my money. So we're all set for a jump to Betelgeize, hope I get to write about it on the other side!